EDIT: Still primarily GPU limited (Probably not a surprise though.) but good gains for DX12 especially for lower resolution when the CPU is a more deciding factor in overall performance though past 2560x1440 it shifts over. Still a good use for D3D12 and solid improvements to performance. 2080ti, what a disappointment for such a price. So.... even the new RTX cards still can't run games at 4K 60FPS yet? Or is it just that this game has terrible performance. It doesn't even look that good to warrant the performance hit... Assassin's Creed Origins looked and performed much better than this. Also I have just completed this game, It's not been a good game, puzzles are way too easy and boring and soooo much talking! Thanks for the review! The game looks really well optimized to me. What are your impressions Hilbert? I would say that everything pretty much gets what it should. It was also time to see a good DX12 implementation, after Forza Horizon 4 and Gears 4 (although a lot of people forget Quantum Break, which still has incredible visuals). I wonder how this will look and perform once it has DLSS. Hilbert please do a followup once support is released! 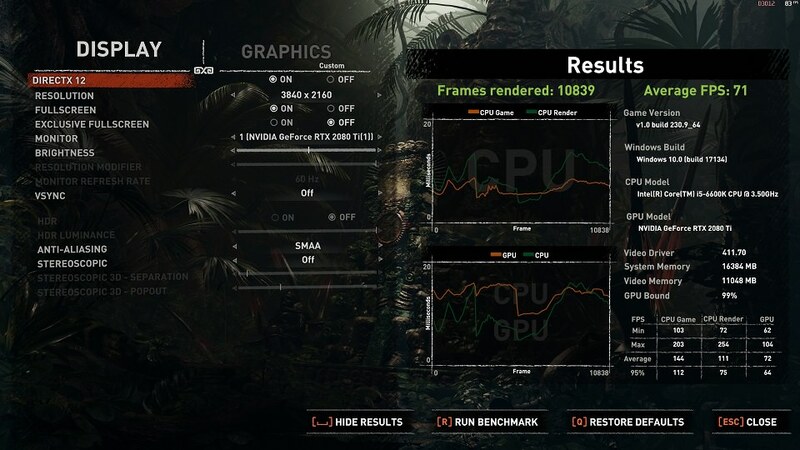 Ultra shadows only lowers it by two fps bringing it to an avg of 69fps. This seems like a generic boring game though. It's certainly a disappointment, but we all knew that. The 2080 Ti is not the card that 4K gamers like me have been waiting for (and the price hike is just an insult). I am a Tomb Raider fan so I'll probably give this game a go (although not full price), but I'll stick with 1440p for now. FuryX aged so bad. I noticed in many newer games it's even slower than RX580 and 390x. I remember people were saying this GPU will shine through fine wine AMD drivers and DX12 but look at were this GPU stands now! Impressed to see DX12 actually making a worthy entrance finally! Looks like my GTX 1070 will be fine for this game when I eventually buy it in a sale, I've still not played Rise of the Tomb Raider yet, it's in my library waiting, if I can tear myself away from my BF1 obsession! From this review it very much seems to be due to the low amount of memory in Fury (X) cards. 4GB is probably starting to be suffering with new AAA games these days. Back when Fury X was released 4GB wasn't actually much for the top card. Even my lesser 390 has 8GB. And 390X at level of Fury X. Apparently, AMD can get some gains there, not small ones. And nVidia can uplift performance of 780 Ti too. Please add to your chart a note on the GTX 1060: is/was it 3GB or 6GB? Probably the latter, but it makes a big difference especially at higher res. Thanks for the review. Love when you do these benchmarks. I can read these graphs all day. I think the graphics look really good. I purchased the game today as I'm off work and ran the benchmark, my 1080ti runs identical in 4k as benchmark scores here. It's really interesting and I wish more games were like this, for those going on about 4k60, this game may not hit "4k60 stable" but it doesn't dip below 35fps either. Usually a game not averaging 60fps has lows in the 20's or even teens - FF15 anyone? But this is an anomaly. The lows stay higher than normal. I'll take higher low's, than useless higher, highs. I don't need 90fps in a scene, personally, I'd rather have 40 vs. 30 in a more intense scene. This game delivers that. I'm interested to see how they implement RTX, how it looks, and what the performance hit is like now that nvidia has drivers out and ms has the update out. I look forward to those benchmarks. Yes indeed, the 6GB version. I read this game scales super well in SLI and with those 1080Tis you should be able to play at 4K no problem. I'm currently gaming at 3440x1440 and it works better than expected. 4K is off the table though for me. So with Turing, Nvidia finally gets proper DX12 performance (well, at least this title), something AMD had done well with earlier. Cool article, it really shows that when DX12 is implemented correctly it's pretty awesome. I also noticed that the new 2000s also really take advantage of it as well which is nice to see, also makes me wonder what a modern AMD GPU will be like when the time comes! Love the game personally have been a fan of the last two re boots which are both very well done especially the one before Shadow. Man with RTX on this title is really going to be insane and a perfect PC show case of what can be achieved on a PC. Man imagine multi screen with RTX on, damn that would be crazy(probably need SLI 2080 Ti's, really want to see the updated article with RTX on when you post it, hope it has some sort of scaling). Can you guys imagine what next year is going to be like!? 7nm CPU madness and God knows what GPUs will drop! So far it has been one hell of a year I am about to play Assassin's Creed Odyssey in multi screen and my 1950x and 1080 Ti just winked at me Let's GO!!!! Food for thought - I think you should realize that the game developers set a target and then start to design what is possible, and in the last stage of development make choices to reach that target. Pretty much what I am saying is that in a certain point of development the teams say, okay what are our goals. 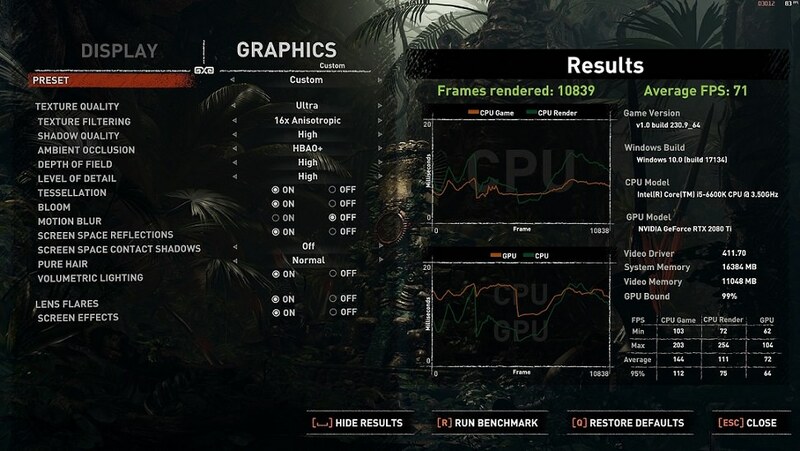 I think the software houses will say 60 fps with the best graphics card at Ultra HD is the target, and then they develop in such a manner that it is achievable. So what can we get out of the game engine at maximum while maintaining 60 fps at UHD. I mean if you enable medium quality settings and the software houses would have named it 'ultra mode', you'd have your 100+ FPS at Ultra HD. Would you be happy then? I think the push in graphics quality will always be that 60 fps for devs, and if you want more that's where a notch lower in image quality would serve you. I have to say I'm impressed that they seem to be the first game where dx12 really shows advantages in performance all over the board. Well done. Only with Turing and AMD. Excellent point HH! Thank you.